Hirokazu Sawamura let out a shout and thrust both arms in the air. 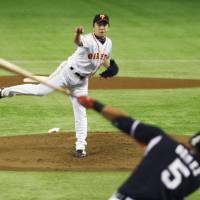 The Yomiuri Giants pitcher had been bitten in his first two starts against the Hanshin Tigers, but the third time turned out to be the charm. 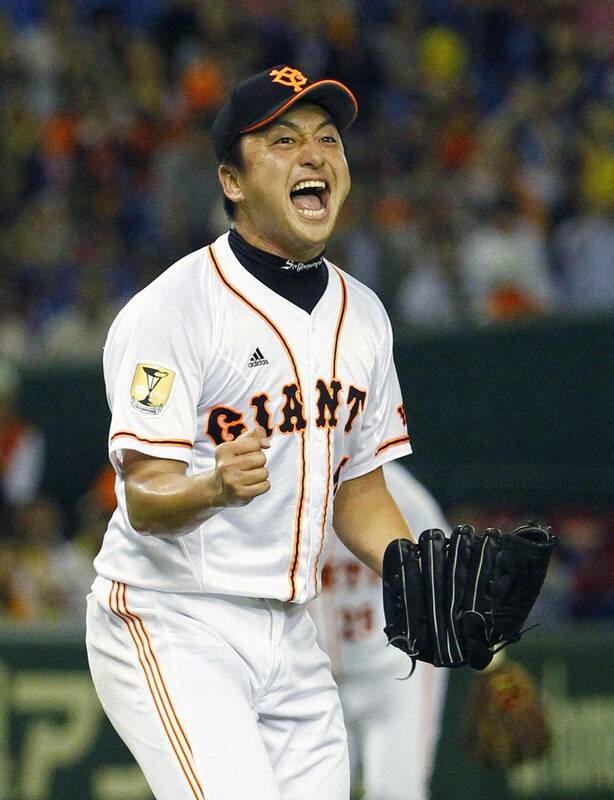 Sawamura threw a two-hit shutout and aided his own cause with an RBI double to help lead the Giants to a 4-0 win over the Tigers in front of a crowd of 45,176 on Thursday night at Tokyo Dome. 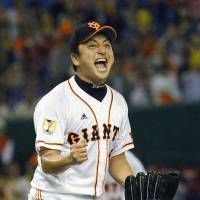 “I felt great throughout the game, but especially after the last out,” Sawamura said. Sawamura (2-3) struck out 10 and limited the Tigers’ offense to Takashi Toritani’s single in the first and a base hit by Ryutaro Umeno in the third. 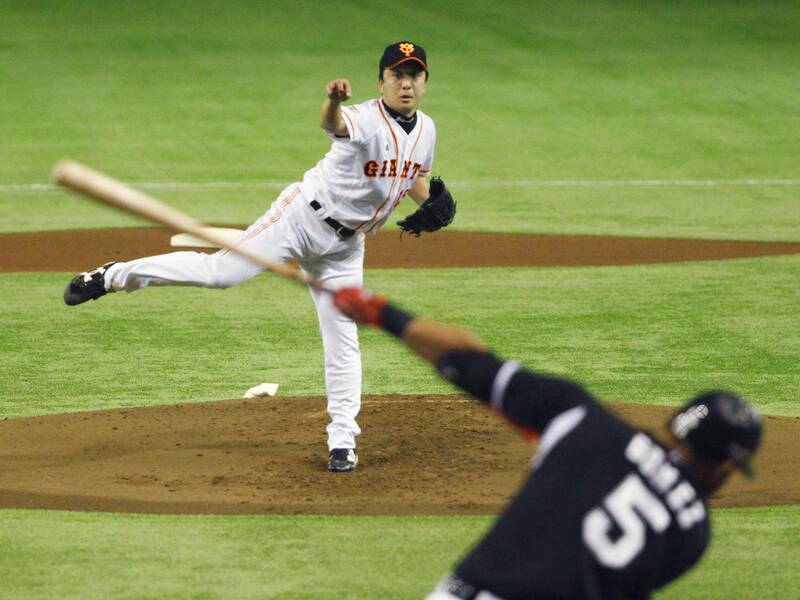 The Yomiuri right-hander, who walked a pair, didn’t allow another hit the rest of the way. “I got into a rhythm and except for a couple of walks, I was able to get the Tigers batters out with the help of our defense,” Sawamura said. The performance was easily the high point of what has been a tough season for the fourth-year pitcher. He didn’t make his first start until July 6 while on the mend from an injury to his right shoulder. He threw eight innings of one-run ball in his first appearance, a win over the Chunichi Dragons, but lost his next three starts. Two of those outings were games against the Tigers where he pitched well but was doomed by one or two costly mistakes. Sawamura, who saw his ERA shrink from 5.51 to 4.32, finally put it all together on Thursday. “I think he looks better this year than he’s looked in previous years,” said the Tigers’ Matt Murton, who went 0-for-3 and saw his average fall to .336, dropping him from first to second among Central League hitters. Giants outfielder Itaru Hashimoto led off the bottom of the first with a home run to give the home team an early lead. Hashimoto singled in his next two at-bats and ended the game 3-for-4 at the plate. “Chono has been out and I decided to go with Hashimoto in the leadoff spot,” Yomiuri manager Tatsunori Hara said, referring to Hisayoshi Chono who suffered a minor knee injury last week, but was available to pinch-hit on Thursday if needed. The Kyojin gave Sawamura a big cushion in the second, reeling off four consecutive hits, a stretch that included the pitcher’s run-scoring double and RBI singles by Yasuyuki Kataoka and Hayato Sakamoto, to drive in three runs and make the score 4-0. Tigers starter Shintaro Fujinami (8-7) struck out eight, but allowed four runs on seven hits through five innings. Fujinami also walked two batters and lost his third consecutive decision. The Hanshin offense was collectively caged for most of the night, with the team managing to get just four runners on base. August to make room the National High School Baseball Championship. The Tigers last played at Koshien on Aug. 1 and were scheduled to return home to face the Tokyo Yakult Swallows on Friday. The team, which hosted a pair of “home” series at Osaka Dome during their time on the road, went 11-9 away from Koshien this month. The team left Koshien in second place in the Central League and 2 1/2 games behind the first-place Giants and will return in the same spot. The Giants did their job by keeping their rivals from creeping closer in the standings but acknowledged that nothing has been decided yet.